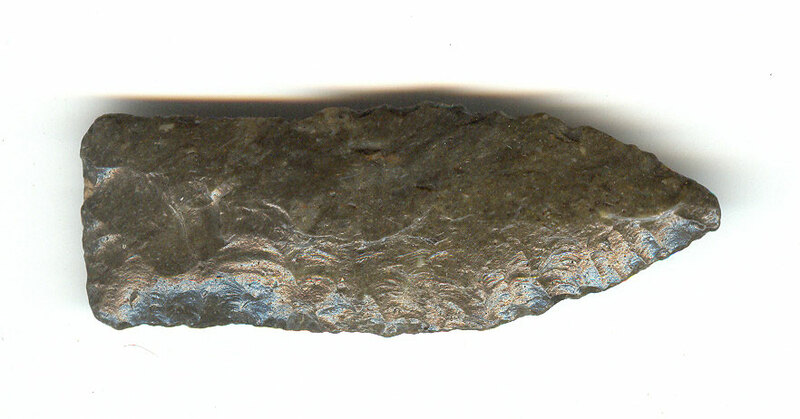 A Medium Size, Thin, Visibly Aged And Anciently Use Sharpened, Well Made Scottsbluff Point That Exhibits Surface Sheen And Overall Stone Coloration Aging Patination, Heavy Overall River Or Stream Surface Polish, Correct Rolled Basal Stem Edge Hafting Dulling, Correct Style Base And Overall Shape, Correct Early Style Blade Flaking, Correct Material And Manufacture For The Area Found. Found By Tammy Johnson In Sabine Parish, Louisiana. Ex-Tammy Johnson, Lonnie Hartline And C.F. Haberland Collections. This Example Has A Long Weak Shouldered Base And Made By The Cody Complex. Includes Dwain Rogers, Ken Partain And Dr. Stephen G. Granger Certificates Of Authenticity.